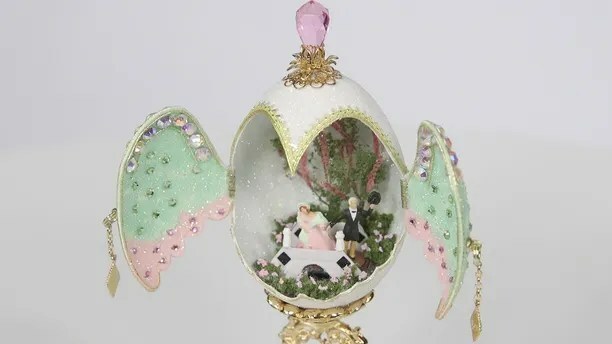 The 2018 design comes from Deborah Grassel, who resides in Austin, Texas, and holds a Masters in Egg Art from the International Egg Art Guild. Over the course of her 21 year career, Grassel has decorated more than 400 eggs — and surprisingly, she has only broken one in that whole time. The 2018 design comes from Deborah Grassel, who resides in Austin, Texas. Grassel’s 2018 design, dubbed “Wings of Prayer,” features angel wings that actually open to unveil a handmade bridge holding President Trump and first lady Melania Trump. Grassel says she was inspired by Melania’s elegance. It’s a hot ticket, says Anne Alonzo, the president and CEO of the American Egg Board.